Now that the long winter has drawn to a close, we can finally look forward to cruising around in warmer weather. Our Automotive Green Vests offered a few tips to make this spring and summer’s driving experience the best one it can be! regular cleanings can preserve its value. You definitely don’t want salt residue from the last snow storm hanging around on your car or truck’s paint. That’s why it’s good to have the buckets, mitts, soaps and brushes all together and easy to find. When the car’s clean, consider giving it a good wax job to help protect the finish and enhance its beauty for longer under environmental stress. According to some of our very own car-aficionados, a clean engine bay can enhance a vehicle’s performance from a cooler running engine. That means, if you can remove the winter build-up of grease, dirt and grime, we’d surely recommend it! Green Vests like using a power washer to reach into hard-to-get places and remove any unwanted cling-ons. Restore the headlights. Although this is important year-round, the beginning of spring is a good time to check them for winter’s residues. Meguiar’s makes a great headlight restoration kit to keep them looking new, and to keep you seeing well while driving at night. You want to make sure everything that holds fluid is topped off. Many of a vehicle’s fluids aren’t used up like gasoline, but they still degrade or sometimes weep out in older vehicles. Specifically check the condition and level of the coolant, and the Freon in air conditioning systems. Check around reservoirs for any suspected leaks. Check the air level in your tires. 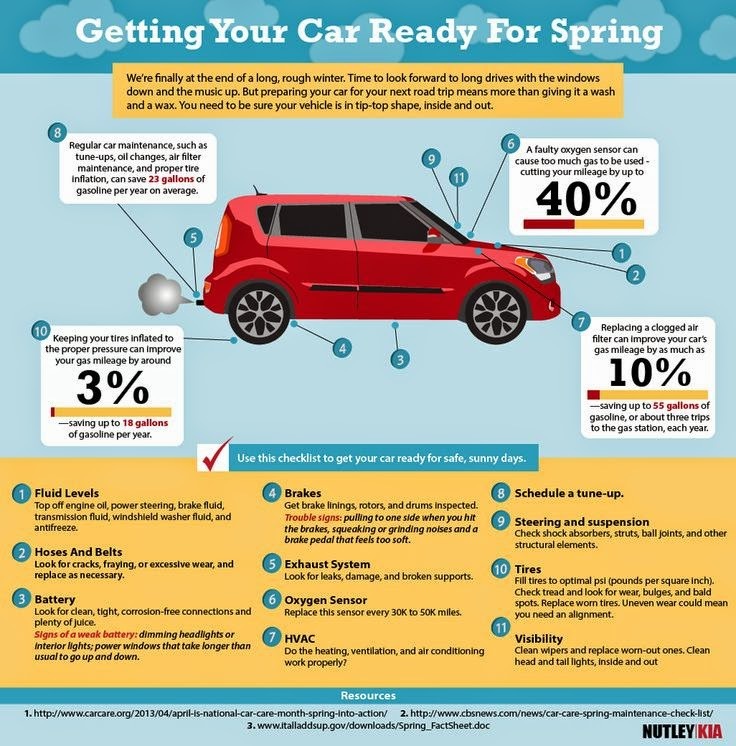 While warm temperatures typically make tires inflate a little more, you don’t want them to be over-inflated– tires need to be on point year-round. The ideal pressure for your car’s tires will be listed on the (usually white) tag, located on the driver’s side door jam. Believe it or not, it’s going to get hot! Make sure your air conditioner is functioning properly. If your vehicle doesn’t have one, pick up an auxiliary fan. Now through the summer months are the most popular time for sunshades as well, so check out our large selection of fold-up and pop-up varieties. These are just a few tidbits to bare in mind to keep you cruising around with ease! If you have any car-related questions, don’t hesitate to get in touch with our Green Vests!